https://cdn2.hubspot.net/hubfs/644585/Bio_-_Case_Studies/NxClinical%20Software%20Sig%20increases%20efficiency%20in%20reporting%20at%20Combimatrix%20and%20invitae_Case%20Study%20Cover%20Page.jpg NxClinical software significantly improves efficiency and turnaround time at CombiMatrix, a clinical diagnostic laboratory, and provides the laboratory a robust system for data management, analysis, and interpretation of genomic changes. CombiMatrix |Invitae is a clinical diagnostic laboratory specializing in cytogenomic testing for prenatal diagnosis, pre-implantation genetic testing, miscarriage analysis, and pediatric developmental disorders. Prior to implementation of NxClinical, CombiMatrix’s data processing and interpretation workflow was extremely laborious and time consuming, and required many manual quality control steps to ensure accuracy. Additionally, lack of an efficient centralized database system limited the ability to leverage previous case information and share data among all laboratory staff. Finally, the lab required access to up-to-date reference databases which came at a significant cost and required additional man hours to maintain. NxClinical software significantly improves efficiency and turnaround time at CombiMatrix, a clinical diagnostic laboratory, and provides the laboratory a robust system for data management, analysis, and interpretation of genomic changes. 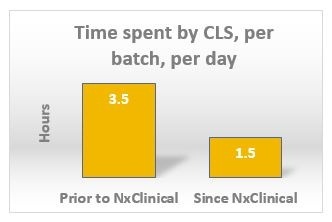 Each CLS saved two hours per day after implementation of NxClinical. Read more by filling out the form on the right to download the case study.